Penn High’s Kingsmen waged a valiant effort, but the Kingsmen were defeated by unbeaten and No. 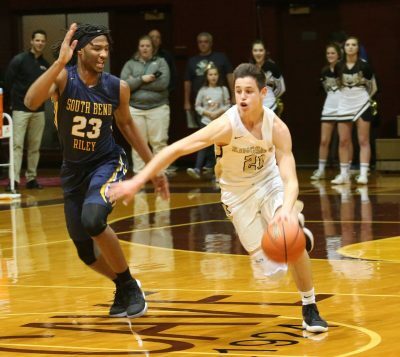 2-ranked South Bend Riley, 60-47, in Class 4-A high school basketball sectional action at Mishawaka on Friday, March 2. Penn’s season ends at 14-10. Riley improves to 23-0. Penn led by as many as seven points early in the first half and led 25-24 at halftime. Noah Applegate led all scorers with 23 points to power the Kingsmen upset effort. Indiana University recruit Damezi Anderson led Riley with 16 points. Drew Lutz contributed 11 points to the Kingsmen effort. PENN 47: Carter Hickey 0, Drew Lutz 11, Beau Ludwick 1, Luke Carlton 0, Noah Applegate 23, Noah Krathwohl 12, Kegan Hoskins 0, Cameron Koschnick 0, Jeffrey Hemmelgarn 0. Riley 60: Trevor Fortune 4, Jalen Jennings 6, Mikel Dorsey 0, Shamar Dillard 7, Damezi Anderson 16, Harrington Greer 4, Gabe Johnson 7, Rylen Grundy 4, Marlon Taylor 12, Ty’juan Reid 0. Three-pointers: PENN 3 (Noah Applegate 2, Drew Lutz 1), Riley 3 (Anderson 1, Grundy 1, Taylor 1).